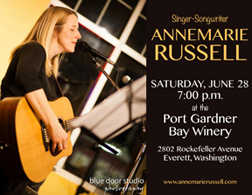 Take note of Annemarie's showsat some fun Northwest venues. Check out Annemarie's live performances on NWCZ radio on YouTube. Last summer, Annemarie was the featured guest on NWCZ Radio's The Aquarium, a show that focuses on singer-songwriters of the Pacific Northwest. Hosted by King Fisn and Big Make, the segment features songs from the new album, plus two interviews with Annemarie and a live performance. Check it out at NWCZ Radio Online . You can download the podcast and catch the show. Interested in Annemarie's musings from the studio this summer and fall? You can read them on her blog. Learn more about the process as Annemarie shares some of the high points and the challenges.